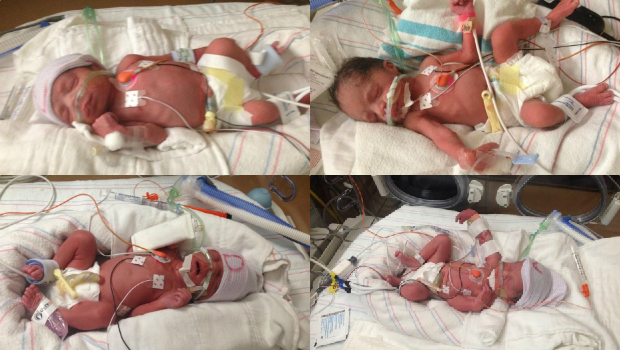 PHOENIX -- A woman died hours after giving birth to quadruplets at a Phoenix hospital, a close friend of the family said Saturday. "They were transporting her from the surgery to whatever room, and she was still unconscious at that point. So, no, she never got to see them," Todman said. "They're beautiful," Todman said. "They have tubes in their mouths and their noses. They've got little monitors and wires all over their body." The infants will likely remain hospitalized for the next two months while doctors help them to get stronger and each reach a goal weight of five pounds, Todman said. Currently, they all weigh between just above two pounds to just above three pounds, she said. "I don't even care to know," Todman said. "It doesn't matter why. She's still gone." Hospital spokeswoman Toni Eberhardt declined comment Saturday, but she released a statement from the hospital: "Our heartfelt thoughts and condolences are with the family during this very difficult time." Todman, who has been best friends with Morales since childhood, said Morales was more nervous about being a new mother than raising four children at once. Because of her previous miscarriage, Morales was apprehensive about getting too excited about the babies' arrival. She mainly focused on doing things correctly throughout her pregnancy such as eating enough, Todman said. "Her focus of her pregnancy was to make sure she did everything to make sure they were healthy so she was able to bring them into this world -- and she did," Todman said. On Friday, Todman started a GoFundMe fundraising website for Carlos Morales and the infants on Friday. The site had received more than $30,000 in donations as of Saturday evening. "I'm so grateful for the overwhelming support and the wonderful comments, and so are Carlos and Sandra, Erica's mother. They are so entirely grateful," Todman said.